One of the best things about our city is all of the great activities for families. 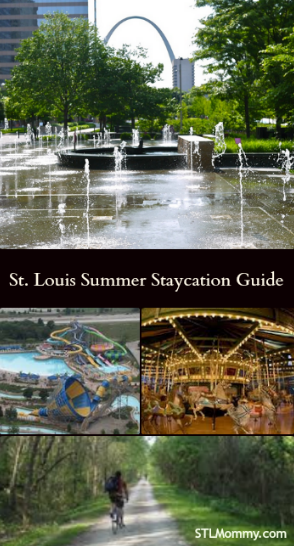 If you’re looking for some fun events and activities in Saint Louis to plan a Staycation or Vacation here’s your guide! Admission to the St. Louis Zoo is always free, but each day during the summer from 8 a.m. to 9 a.m., the Children’s Zoo, the Conservation Carousel, the Stingrays at Caribbean Cove and other special exhibits are also free. The Children’s Zoo has an outdoor playground with slides, bridges and rope ladders. Kids can also get an up-close look at bunnies, guinea pigs and other animals. The 281 acre farm in South St. Louis County is home to hundreds of animals, including the famous Budweiser Clydesdales. They feature a train ride to the farm, pony and camel rides, paddle boat rides a carousel and much more. Grant’s Farm is open daily except Mondays. Admission is free for everyone, parking is $12. General admission to the Science Center is free. This includes access to more than ten various exhibition spaces. For the general public, there are fees for parking, tickets to shows in the OMNIMAX® Theater and the James S. McDonnell Planetarium. Members of the Science Center receive free and discounted tickets. The Science Center is open Monday – Saturday from 9:30am – 4:30pm and Sunday from 11:00am – 4:30pm. The tram rate is reduced to $10 until the middle of May. Online tickets cannot be purchased less than 2 hours in advance. Group pricing is available for parties larger than 20. For more information, please call 877-982-1410. *Due to construction, visitors must have a “Journey to the Top” tram ticket to enter the Arch facility. Tickets are available for purchase online or at the Old Courthouse Ticket Center. For questions or assistance with ticket reservations, call (877)982-1410. We sell out early and often, so advance ticket purchases are recommended. St. Louis’s children’s museum has free admission for families on the third Friday of the month from 5:30 p.m. to 9 p.m.
Citygarden is a public park filled with fountains, wading pools, sculpture and more. It’s a great free place for kids to play on a hot summer day. Citygarden is located along Market Street between 8th and 10th Streets in downtown St. Louis. It is open daily from sunrise to 10 p.m. Admission to the Museum is free every day. General admission to the Museum is always free. Hours: Monday, Wednesday, Thursday, Friday, Saturday, Sunday: 10 a.m. to 5 p.m. Admission is charged for some special exhibitions.The Missouri History Museum is a member of the Metropolitan Zoological Park and Museum District and receives funding through the Missouri History Museum Subdistrict. The Museum is also generously supported by memberships, gifts, and grants. Admission to the Visitor Center is always free. Parking is free on most days, but there is sometimes a parking fee during special events! Museum is open 7 days a week. Eckert’s Farms, family-owned and operated since 1837 by seven generations of Eckerts, is the largest pick-your-own orchard operation in the United States. Starting as a simple roadside stand in 1910, the Eckert family now owns and operates farming, entertainment, and retail entities in Belleville, Grafton and Millstadt, IL. We have grown from simple fruit orchards into family entertainment centers that feature special children’s activities, annual events, festivals and the Eckert’s Country Store and Restaurant. Will reopen in June 2015. The Museum of Transportation, in West St. Louis County, MO, houses what has been recognized as one of the largest and best collections of transportation vehicles in the world. Admission is free to the Children’s Garden at the Missouri Botanical Garden on Wednesday evenings from 5 p.m. to 7 p.m during the Whitaker Music Festival. The Children’s Garden is designed to teach kids about nature in a fun way. There’s a tree house, frontier fort, outdoor classroom and more. St. Louis City/County residents enjoy free admission on the first Tuesday of every month from 9 -11 a.m. Proof of residency is required. Due to high attendance, strollers are not permitted on free Tuesdays. The Muny is St. Louis’ outdoor theater. Each year they offer a select amount of free seats for it’s productions. View this years schedule HERE. Whether you’re on the hunt for a 100% private indoor birthday party, a super cool spot to host your next team get together, or just a fun place to bounce on the hugest, most gigantic inflatables around, BounceU is a great place to take the kids. Monkey Joe’s is another fun place full of inflatables that the kids will love. Chesterfield Sports Fusion is a unique indoor family recreation facility. There are fun attractions for people of all ages in an inviting and comfortable atmosphere. EPIC 6 is an exciting indoor sports and recreation facility for the whole family. Visit HERE for hours and events. Six Flags St. Louis offers everything from pulse-pounding roller coasters to gentler options for tots. Cool off at Hurricane Harbor or take a break at one of their entertaining shows. The popular water park features a bubble slide, a 600-foot lazy river, a little tot wave pool with spray features and more. Admission for non-residents is $12 for adults and $10 for children. Resident admission is $6 for adults and $5 for children. Kids three and younger are free. The center is open from noon to 7 p.m. There are slides and a children’s play area, plus plenty of room to swim or just relax in the sun. Admission for non-residents is $8 for adults and $6 for children. Resident admission is $5 for adults and $4 for children. Kids three and younger are free. Bridgeton Crossing is open from noon to 8 p.m.
You’ll find everything from large pools and lazy rivers to multi-passenger rafting adventures and speed slides. View all of the rides HERE. The water park sits on the banks of the Mississippi River along the Great River Road. It’s a full scale attraction with a beach, treehouse harbor, endless river, slides, raft rides and more. Admission is $24.95 for adults and $20.95 for children or save $5 by going after 3 p.m. Raging Rivers opens daily at 10:30 a.m. Outdoor Pool Hours are Noon-7 pm Monday thru Sunday. The pool opens at 11 am daily for members only. The outdoor pool will switch to Saturdays and Sundays only after Fox School District resumes regular session in the fall (August). In addition, the outdoor pool will close for the season after Labor Day Holiday. NONRESIDENTS (anyone who does not live in Kirkwood, Glendale, or Oakland) – NEW: In addition to entering the pool as a guest of a resident, nonresidents (NR) may purchase a NR ID card or a NR season pass. The NR ID card costs $30 per year per person and will allow the nonresident to pay the NR daily fee of $8. NR season passes cost $120 for youth (4-17), $145 for an adult (18-64), $120 for a senior citizen (65+), and $315 for a family of three (each additional family member costs $30). To obtain a NR ID card, each purchaser 16 and older must present a valid, current Missouri Driver’s License showing current address. Purchases age 15 and younger must be accompanied by a person living at the same address who can present the documents listed above. Everyone 4 and older must have an ID card. Each ID card will be allowed up to four guests per day, with a maximum allowance of 16 guests per family per day. All guests will pay the nonresident guest daily admission fee. The fountain and wading pool at Tower Grove Park is a nice place for kids to cool off in the summer heat. There are dozens of pop-jets for children to play in, as well as a large water bowl in the center of the fountain. During the summer, the fountain and jets are on every day. The wading pool is open Tuesday through Sunday. Give your kids a look at a real animal farm complete with pigs, horses, cows, chickens and more. The animal farm at Suson Park in St. Louis County is open daily in the summer. One of the best known of the County’s parks, Tilles is a favored location for picnics. except when reservations are issued. This hilly loop will take you past a rocky glade, forested uplands and lowlands, through valleys, quarried areas and Bathtub Cave. The cave, which is small, dry and virtually impossible to get lost in, offers a great first caving experience for kids. Arriving at the rocky glade, you’ll find a nice west-facing overlook of the Rockwoods area, which is particularly enjoyable at sunset. The beginning and end of the trail are flat and easy, but the middle section has a few steep grades and some stairs. –Kids Bowl Free: Children whose age does not exceed a limit by a participating bowling center are eligible to register for 2 free games a day, all summer long. Go here to see if a bowling center in your area is participating and to sign up! –Kids Skate Free: Go HERE to see if there is a center near you participating and to sign up. Each center has their own rules to participate. In Arnold you have to be 10 or Under in Belleville you have to be 14 or Under. Be sure to check the rules for your participating location. –Bass Pro Shop Free Events for Kids and Families. Plus don’t forget to visit Groupon and LivingSocial for discounts on local things to do with the family! AND the Kids Eat Free list for ways to save when you’re dining out! *If you have more that you would like to share pass them on!